The average household who have their carpets professionally cleaned, have them cleaned on average every two to three years. The majority of households do not have their carpets cleaned, either because they attempt to clean them themselves, or they think cleaning may ruin the carpet, or they have just not considered cleaning their carpets! The rest just have carpets cleaned only when they have to, like a rental End of Tenancy Agreement. This may sound surprising, but, we often recommend to our clients to have their carpets cleaned and maintained every six months. 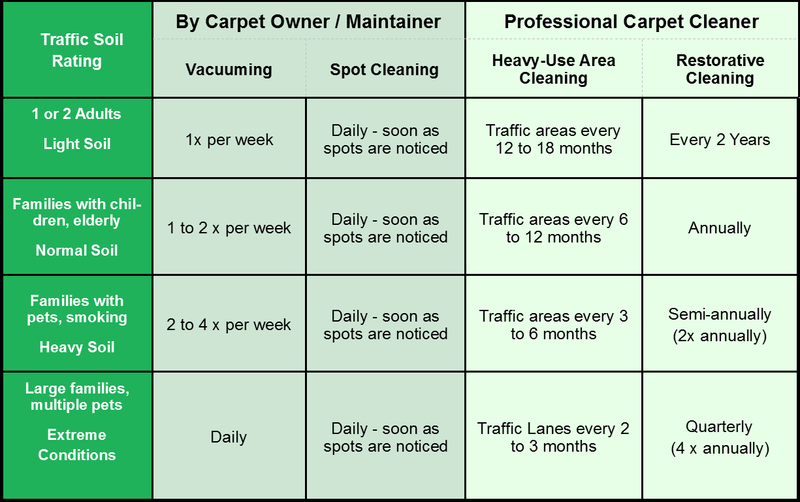 Now, this isn’t for everyone, but it really depends on how busy the household is, (typically how many pets and children you have, see chart below), to ascertain how often your carpets need to be cleaned. This is to keep them at their optimum level and to greatly increase the life of the carpet and keep them looking clean, fresh and healthy. Try this, imagine for a moment you laid a white bed sheet on your hallway and living room floor! How long would it be before you had to pick it up and put it straight into the washing machine? Not very long I would bet! Now carpets are designed to withstand a multitude of dirt, stains, foot traffic and general abuse, they are quite amazing if you think about it. All major carpet manufactures recommend that carpets are professionally cleaned every six to twelve months. For some manufactures, the carpet warranty can become invalid if the carpet is not cleaned at least every twelve months. There are very good reasons for this, but the main reason is the dirt acts like an abrasive on carpet fibres causing premature wear and tear, it cuts into the fibres and causes damage. The best way to prevent this is good carpet maintenance. So what are the main benefits of maintaining a carpet? Ø Your carpets are kept clean every six months, removing the dirt, pollen, exhaust fumes, spots & stains etc and keeping them clean. Ø The maintenance cleaning process is much more gentle on the carpet than one-off, more aggressive ‘deeper cleans’. Ø You never have to worry about calling a carpet cleaning company again, you are contacted when your next maintenance clean is due. Ø No big or expensive cleaning bill as the payments are spread into very low monthly amounts. Ø And best of all, if you have an accident or spillage, at any time, you get free stain removal callouts whenever you need them. Although this is a very popular option for our clients, I am surprised that more people don’t choose to have their carpets regularly maintained. Let me know how often you clean your carpets, if at all, (be honest), in the comments section below.